Kishima Nagi is on the mend, and wonders if her psychiatrist, Dr. Kisugi Makiko, thought her fits of pain were only in her head. Nagi doesn’t know that Kisugi discovered the vial of the mysterious drug Scarecrow used to heal her. 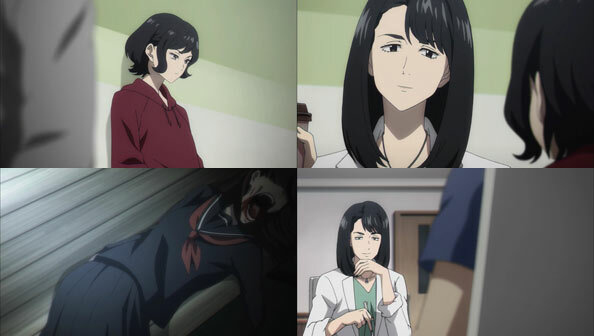 Kisugi experiments on lab rats, but soon it’s clear she’s graduated to unwilling human test subjects, who are turning up all over town as the victims of a serial killer with a very specific method of ripping open the jaw and sucking out the victims’ brains. At night Kisugi roams the dark halls of the hospital, preying on patients by heightening their fear (she’s capable of seeing someone’s weakness the same way Jin could see their flowers) then sucking the fear-filled blood like a vampire. She revels in being able to rip out her own eye only for it to regenerate; clearly she’s her own test subject as well, and she’s downright drunk on the fear of others. She determines that the best-tasting fear comes from those who’d normally have none, like bold young women, which is why so many of her victims are high school girls. But as a psychiatrist she is also considering using her talk patients as food/research fodder. 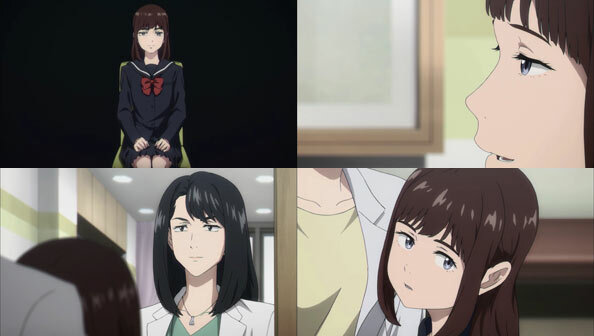 One of those patients is a young Miyashita Touka, sporting long hair and flanked by her mother, who fears she has Dissociative Identity Disorder. 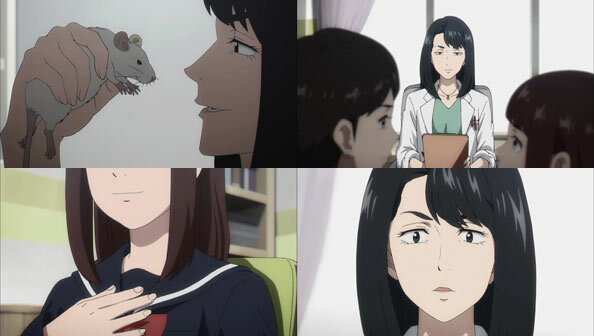 This confirms that while we enter the world of Boogiepop with Touka as a high schooler, Boogiepop has been showing up in her body since far earlier. Excusing Touka’s mother, Kisugi has Touka talk like a man, and before long, her other personality is out, and wastes no time describing who they are (neither man nor woman, for one thing) and what their mission is. 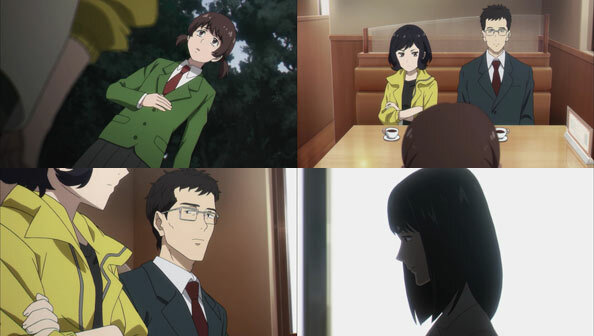 Boogiepop tells Kisugi that she’s a predator for people so normal it’s easy for them to be “set off” like fuses into someone who could be a threat to the world. 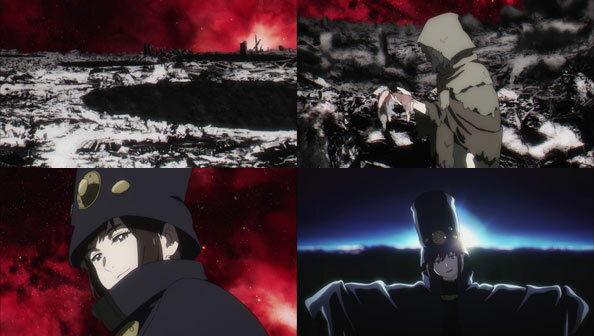 Boogiepop exists to eliminate threats to the world without mercy. 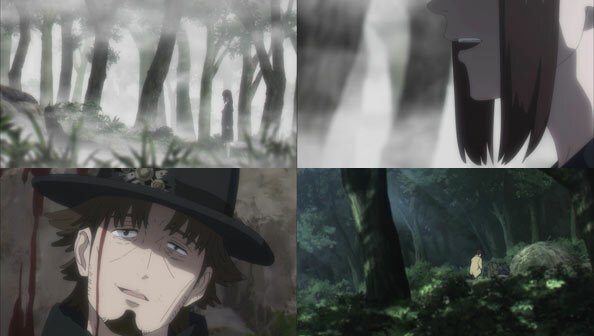 Their discussion puts Kisugi on notice as someone who should probably stop what they’re doing lest they incur Boogiepop’s wrath, but it may be too late. 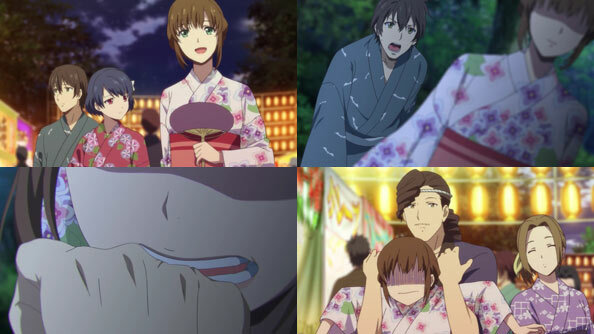 Kisugi doesn’t seem willing or able to control herself anymore; she’s in too deep. 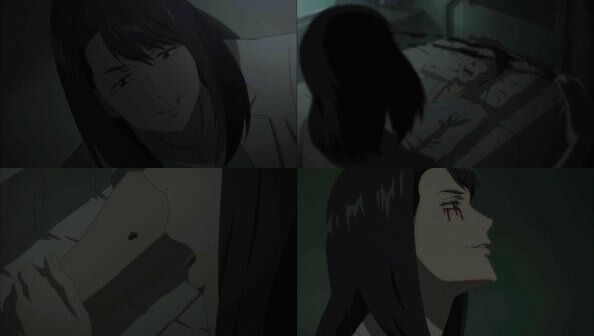 Though if there’s a bright side to all this, it’s that she won’t end up killing Touka as she considers here; we know Touka will be fine, and that her “disorder” won’t be “cured”, nor should it be. 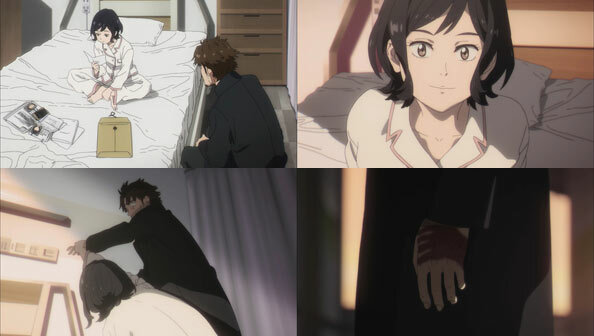 So the question is, how will Boogiepop, possessing Lil’ Touka, take Kisugi down? Or will Towa, whose serum she’s messing with, do it for them? 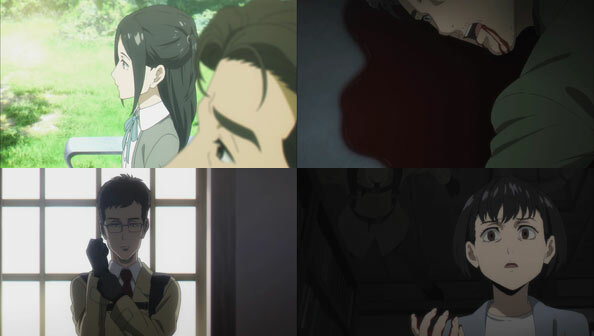 Boogiepop and Others is hard enough to follow without having surplus episodes piled atop one another, but the day after last week’s conclusion to the Imaginator arc, that’s just what happened: four episodes dropping at once, comprising an entire arc. Because this first of the four had its own OP, ED, and self-contained story, I’ve decided to watch and review them each separately, as if they aired on different days. This is the story of how Boogiepop got her admittedly bizarre name. She’s responding to a question from our favorite benevolent alien, Echoes, while the two are wandering a ruined, post-apocalyptic landscape. A stuffed animal that crumbles in his hand suggests it’s Earth of the distant (or not-too-distant) future. Wherever and whenever it is, it’s super creepy. Boogiepop’s name origin story starts with a detective named Kuroda, AKA Scarecrow. Like Orihata Aya/Camille, he’s a synthetic human working for the Towa Organization. His colleague Pigeon gives him his next mission: checking up on fellow member Teratsuki Kyouichirou, suspected of betraying Towa. We learn from Kuroda that Towa is a vast network primarily dedicated to unlocking the mysteries of human evolution; both how we got to where we are, and what comes next. 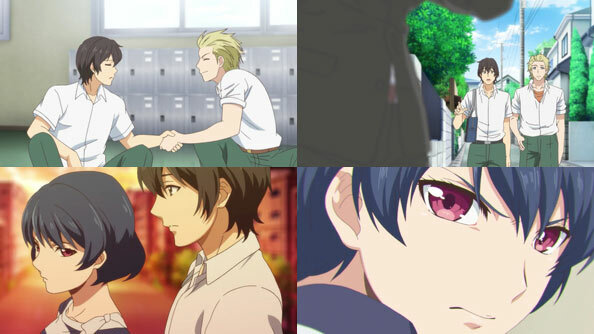 Teratsuki kinda fades into the background as Kuroda finds someone more intriguing at one of his sprawling medical facilities: a young Kirima Nagi (younger than the previous episodes in which we’ve seen her). She notes that her somewhat unusual first name is based on the sentiment of “keeping calm no matter the situation”, and her personal situation is not optimal: diagnosed as “growing pains,” she has fits of pain so intense she can’t even describe it. 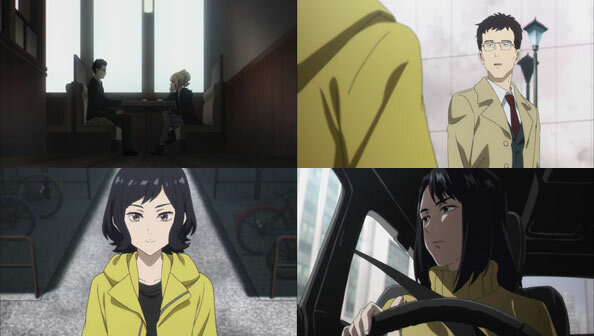 Nagi is also very much like the young woman we’ve seen in the present thus far: gorgeous, upbeat, direct, intensely curious, and dedicated to the truth: a natural detective in larval form. 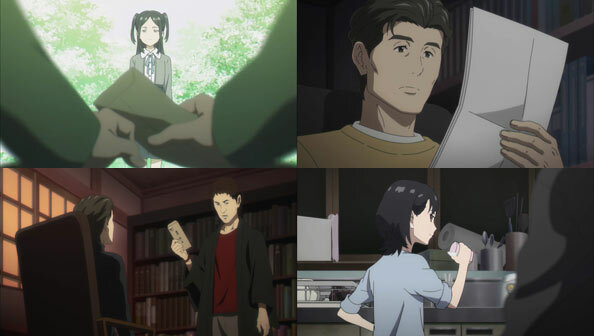 Once Kuroda gets past her guard (Naoko), he presents the results of her request for him to investigate her: he discovered her agent was embezzling her money and got him fired. 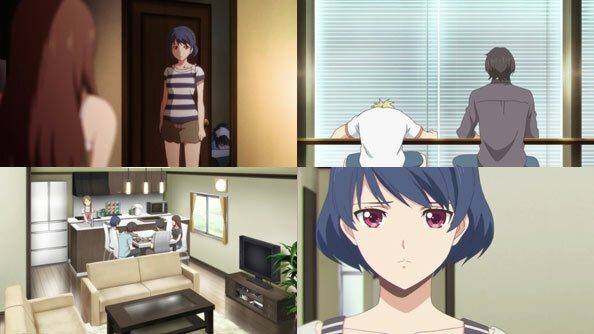 But despite all the qualities that make our Nagi Nagi in the present, this past Nagi is deeply uncertain and apprehensive about who and what she should become, if and when her condition is healed. Kuroda asserts that everyone feels that way on the road to coming into themselves. He himself dreamed of becoming a superhero who, unlike a detective, didn’t have to worry about all of the peripheral crap that comes with solving crimes. Just rush in, get the job done, and call it a day. This perks Nagi up, and she says Kuroda should definitely become a superhero. Their visit is cut short when she starts having fits of pain, but when she grabs him, it leaves a raw mark, almost like a burn. That clinches it for Kuroda: Nagi is one of the “NPSLs” its his usual mission to locate. She’s evolving to the next stage…but it’s a rough gestation, which is keeping her in a hospital bed, unable to realize her own dreams. Thus Kuroda—”Scarecrow”—decides to make a grand, superheroic gesture to Nagi, whom he’s decided to be the recipient of his heroism. He ransacks a Towa facilities to find a serum that would normally act as a catalyst for human evolution. Because Nagi is already evolving without it, administering it offsets the “possibility” that is tearing her apart from within. With one injection, he enables her to live the (relatively) normal human life she enjoys in the present. While his act was both heroic and kind from the perspective of those of us rooting for Nagi to survive and thrive, it also broke a lot of Towa rules, and they send an assassin to eliminate him for his treachery against the organization. That assassin, Sasaki, is lightning quick of foot and deadly with a knife, but Kuroda demonstrates he can be pretty fast himself. While the two may look like a couple of regular-looking schlubs, they move like superheroes. 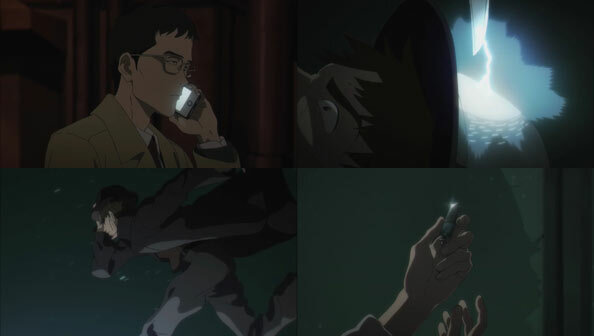 While Kuroda gets away, it isn’t before Sasaki gives him a wound from which he knows he won’t recover. 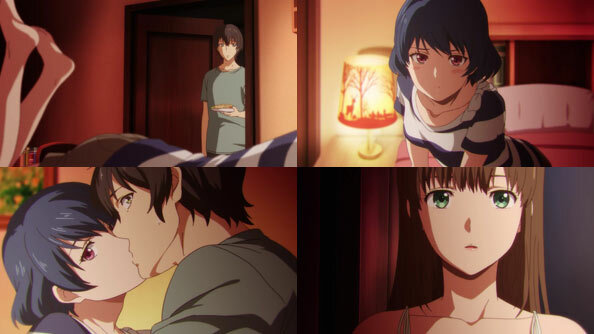 That’s when a “reaper” appears, in the form of Touka, offering a chance to judge him favorably for doing something heroic for someone, even if it led to his demise. Kuroda wonders if he’s speaking to a near-death delusion, but we know she’s really there. He calls her “creepy bubble”—like a boogieman that pops into and out of existence. 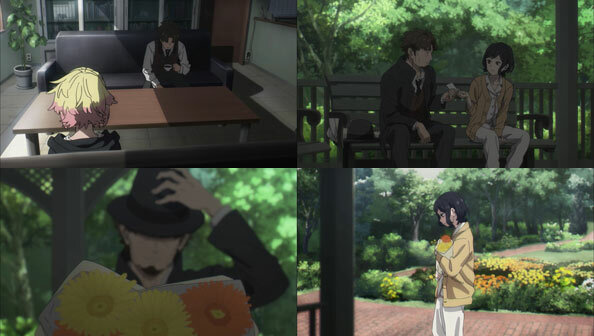 Thus the title “Boogiepop”. When Sasaki finds Kuroda’s body, the Scarecrow is smiling, and why not? It may have cost his life, but he saved Kishima Nagi. For one night, he was a superhero. And one night was enough.